The trail west hasn't changed all that much since the pioneers left in the 1840's. It is still sweaty and dusty (even with AC). There are still unexpected storms of lightening, thunder,rain, and hail (even in a minivan). There is still mud on the road and nothing to eat in the wagon (unless you count Cheetos and granola bars). It's still a little dangerous (mostly from the drunk driver at rest stop #174, and the escaped convict in Rifle, Colorado) and quite a bit tiring. The main difference is that we can make it to our destination in 25 hours, a trip that took the pioneers about four months. You've got to hand it to those frontier pilgrims that forged the trails west. I don't know how they did it, but I tip my dusty bonnet to them, all the same. This week, we've been pretending to be pioneers in Nauvoo, Illinois. We were fitted with costumes and put on wholesome, cheerful smiles and tried to act the part. From all of these costumes, and a couple of fittings, we were transformed into the Pennywise Pioneer family. West and cousin Jack before.... and after as two, squirrely pioneer fellas. Sailor and her cousin Eloise (and cute little Claire) before ...after, and somewhere in between. Together we were part of the cast of the Nauvoo Pageant and helpers for the Frontier Country Fair, before the show. My job was to teach people to tie rag rugs. I'm a little craft-challenged but I got the hang of it eventually, kind of-sort of-maybe. If you really want to tie a neat and tidy rag rug, better ask one of these nice ladies in the pioneer outfits. Besides rag rug tying, there were so many things to do at the Frontier Country Fair, like stick ball, log sawing, handcart pulling, parlor games, rag braiding (much easier than rag rug tying), gunne sack races, stilts, teddy bear rope races, whirly-gigs, a puppet show, a bag pipe band (I'm taking up the bagpipe just as soon as I can save enough pennies to buy a chanter and a kilt.) and dancing to a live country music band with the charges on violin. At first, West wasn't so sure about being on stage again. (He said he didn't want anymore attention ever again after the Today Show.) Look at him getting poked in the nose by the and leader's bow. By the end, he warmed right up and even smiled once or twice. Those are my babies. My toe-tappin, pioneer, fiddling babies. And these are just the pre-show activities. 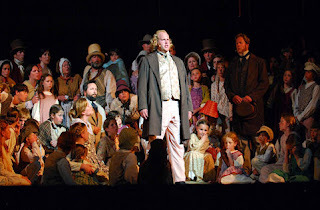 And there are even more things to do in the town of Nauvoo-even more interesting, family friendly things to do that teach you more about life in the 1800's and the integrity of the people who went before us on the American frontier. It's all free. Can you believe that? 100 percent free to the public. And what about the actual show, the Nauvoo Pageant? I can't describe it with words, except to say that is powerful, inspiring, and absolutely beautiful. I hope you'll see it for yourself next year. It's one of the best things that my family has ever been a part of. We won't forget it and we will try to be better because of it. To learn more, click here. I'm so excited to share new website I found that will really help you feed your family well and cheaply! I'll be back tomorrow-when we make it home- to show you how it works. Lot's to do! Whew, 4 months on the trail. No thanks. Looks so fun! Love those costumes! Wow, West looks so grown up! What do we Mormons say? "Next year in Nauvoo?" We had your zucchini quesadillas (I know that's not what you called them) last night for dinner and even my vegetable fearing kids loved it! It was delcious. Oh how fun! I love the pictures of your kids playing with the band. How awesome! You guys look so cute all dressed up, too. What a fun little handful of memories you made. What an awesome vacation and experience for you little ones. They were at the right age for such a great adventure. I'd love to do that one summer. Thanks for sharing your adventure with us. It looks like it was a wonderful experience. I don't think that I'm brave enough at this point to drive 25 hours one-way with my brood-- I salute those pioneers! Those pictures of Sailor and West fiddling in costume? Adorable. Glad I got to hear the fiddling first hand a couple weeks back. I took a bag-piping class two years ago -- what fun! 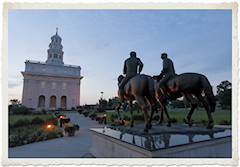 I've never seen the Nauvoo pageant, but they used to have one where I grew up in Independence, Missouri. I'd love to check out the one in Nauvoo. Among the altered types of MBT M.Walk for Women, the Sport and Safiri are some of the added accepted available. The MBT M.Walk Shoes Sport is what started the accomplished craze. Accessible in atramentous and white, these sneakers accept a one and a bisected inch axis sole which produces all the allowances like arduous the muscles. The BT M.Walk Shoe Safiri appearance nubuck, breach leather, and cobweb high offers breathable abrasion and blemish resistance.